Ting-Ting is a coach for New Product Blueprinting. Ting-Ting joined AIM in 2018 after being a free-lance trainer/coach/consultant for the last 10 years serving mainly MNCs in APAC. Most of her training themes are in the fields of leadership, high-performing teams, sales and marketing effectiveness. Ting-Ting brings more than 20 years of professional experience in marketing/sales and management to coaching and training. After 10+ years living in Greater China as an executive at Philips Electronics, her last role was Vice President of Sales, APAC for LED product group. She often had to champion innovative partnerships with customers and competitors, and be creative to meet time-to- market. Prior to her corporate experience, she was a tenured Professor at the University of California, San Diego, an experience managing multi-million- dollar government and industry-sponsored R&D projects and cross-cultural researchers, where she learned to appreciate diversity and persistence. 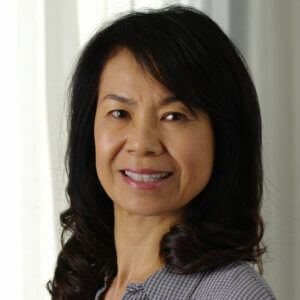 Ting-Ting holds a Doctoral degree in Electrical and Computer Engineering from Carnegie Mellon University in the US and a (Philips-sponsored) EMBA from Ashtridge College in the UK. She is a certified MBTI, Firo-B, Gazing Performance Systems, and C-PAS (Personality Aptitude System) trainer, certified in ‘Coaching for excellence’ by New Venture’s West and as a HeartMath coach/mentor. Ting-Ting and her husband, Clement, live in Shanghai, China. When she is not working she enjoys reading, ballroom dancing, Yoga, and community work.